Glen’s Towing specializes in tractor-trailer clean up and recovery. We operate special heavy-duty rotator trucks, each of which has a crane and a rotating bed attached. These vehicles are used to turn over flipped tractor-trailers, perform work next to a steep hill, and retrieve vehicles from hard-to-reach areas. 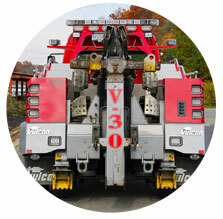 Glen’s Towing also does refueling for heavy-duty vehicles. Receive immediate roadside assistance from Glen’s Towing & Road Service the next time you break down or are in an accident. We enjoy helping you when you need it most. Contact us to learn more about our reasonable rates and excellent service. We accept Comcheks, TCH Checks, EFS Checks, Mastercard, Visa, and Discover. Glen’s Towing provides prompt on-site roadside assistance including jumpstarts, unlocks, tire changes, and battery replacements. We are fully equipped to handle most makes and models of trucks, including commercial big rigs and semi trucks. Glen’s Towing also does auto repairs in our full service garage, equipped with 4 large truck bays, for both passenger and commercial vehicles. We do both major and minor vehicle repairs. From major engine overhauls to tire balancing and minor repairs, such as hose or belt replacement, we do it all. We also fix clutches, transmissions, suspensions, and conduct state inspections.